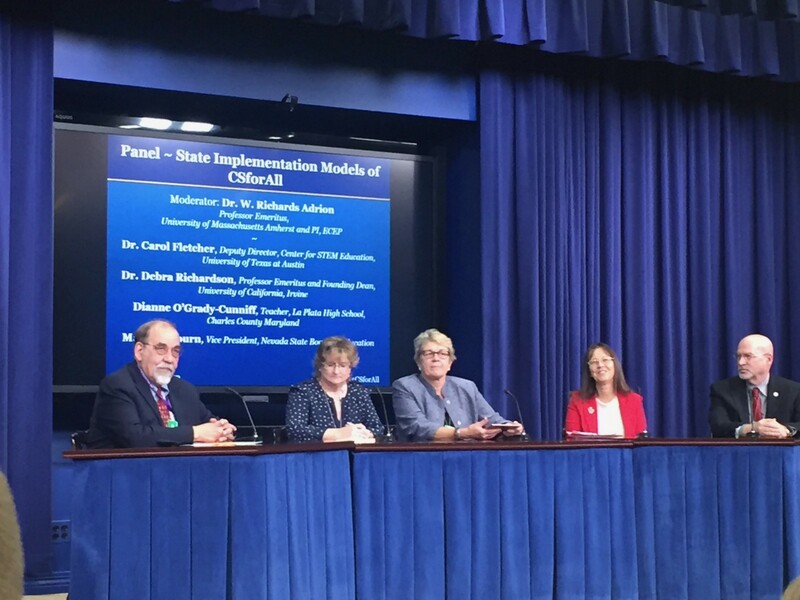 At the end of October, the NSF Expanding Computing Education Pathways (ECEP) alliance organized a summit on state implementation of the President’s CS for All initiative with the White House Office of Science and Technology Policy (OSTP). 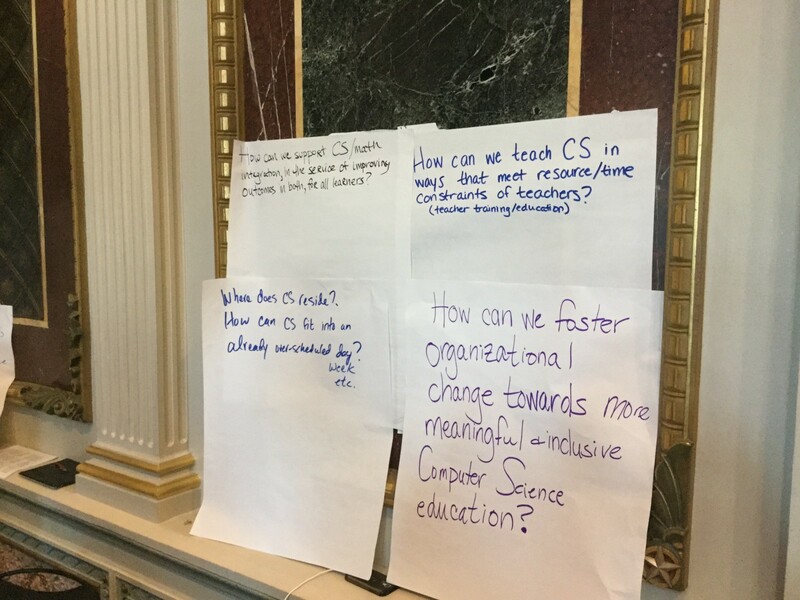 We invited teams from each of our 16 states and Puerto Rico (and a few more states came to the White House summit) to learn from one another, to build on the research base, and to share with administration members their issues in implementing CS for All. You can see the rough agenda here and a press release on the two days of meetings here. Let me tell you about some of the things I learned over the three days. 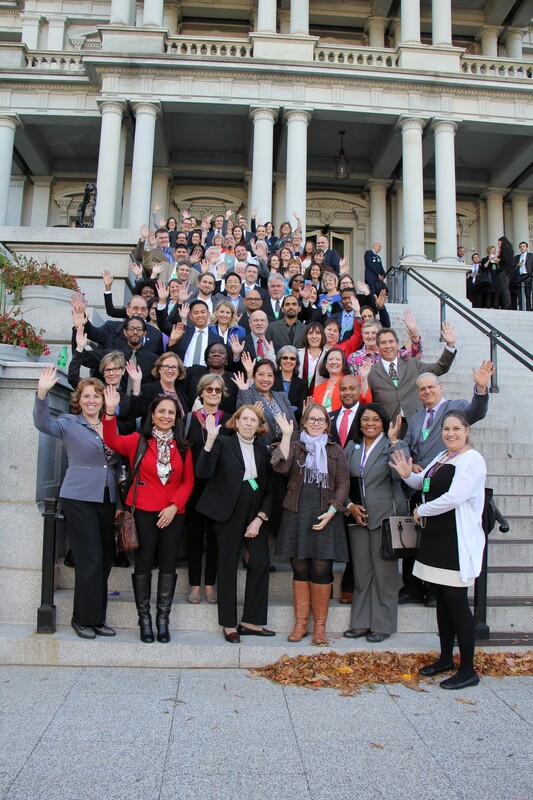 The first part of the day at the Eisenhower Executive Office Building (EEOB) on the White House grounds was organized by the Research+Practice Collaboratory (RPC). I was the moderator for the first panel of the day, where Phil Bell, Nichole Pinkard, and Dan Gallagher talked about the benefits of combining research plus practice. I was excited to hear about the amazing work that Nichole Pinkard (pictured here) is doing in Chicago, working with Brenda Wilkerson in Chicago Public Schools. 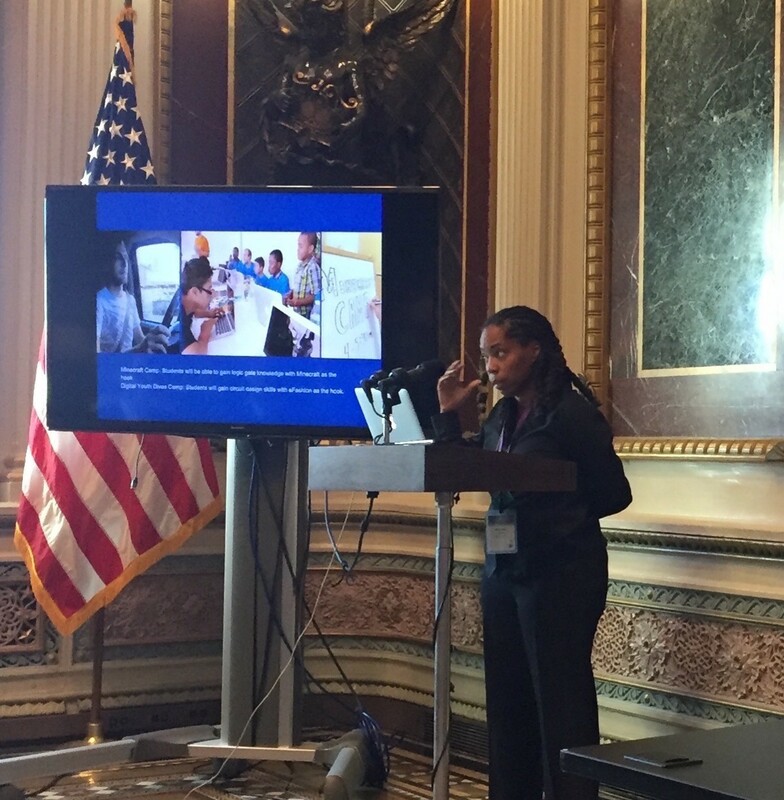 Nichole is a learning scientist who has been developing innovative approaches to engaging urban youth (see her Digital Youth Network website). She has all these cool things she’s doing to make the CS for All efforts in Chicago work. She’s partnering with Chicago parks and libraries — other than schools, they’re the ones who cover the city and connect with all kids. She’s partnering with Comcast to create vans that can go to parks to create hotspots for connectivity. Because she’s a researcher working directly with schools, they can do things that researchers alone would find hard to do — like when a student shows up to a CS activity, she can email the student’s parents to tell them the next steps to make sure that they continue the activity at home. There was a second panel on “Finding the Sweet Spot: What Problems of Practice are Ripe for Knowledge Generation?” I didn’t know Shelley Pasnik from the Center for Children and Technology, and she had an idea I really liked that connected to one of Nichole’s points. Shelley emphasizes “2Gen learning,” having students bring with them parents or even grandparents so that there are two generations of learners involved. The older generation can learn alongside the student, and keep the student focused on the activity. The R+P Collaboratory researchers led us through an exercise of developing research questions that we could see in CS for All. There were a lot of them (only four of the couple dozen pictured here)— there’s a lot that we don’t know about how to implement CS for All. Ruthe Farmer of OSTP (with input I’m sure from Jan Cuny at NSF) put together a terrific summit, started by Tom Kalil from OSTP and capped by Megan Smith, CTO of USA. My favorite panel (pictured above) was the one moderated by ECEP’s Rick Adrion, with representatives from ECEP state teams: Carol Fletcher from Texas, Debra Richardson from California, Dianne O’Grady-Cunniff from Maryland, and Mark Newburn from Nevada. They talked about the unique issues in their states, how ECEP helped them, and what else they need to succeed in implementing CS for All. Ruthe got Jim Kurose, the Assistant Director for NSF CISE Directorate (e.g., he’s in charge of all CS-related funding at NSF) and Joan Ferrini-Mundy to speak at the summit. 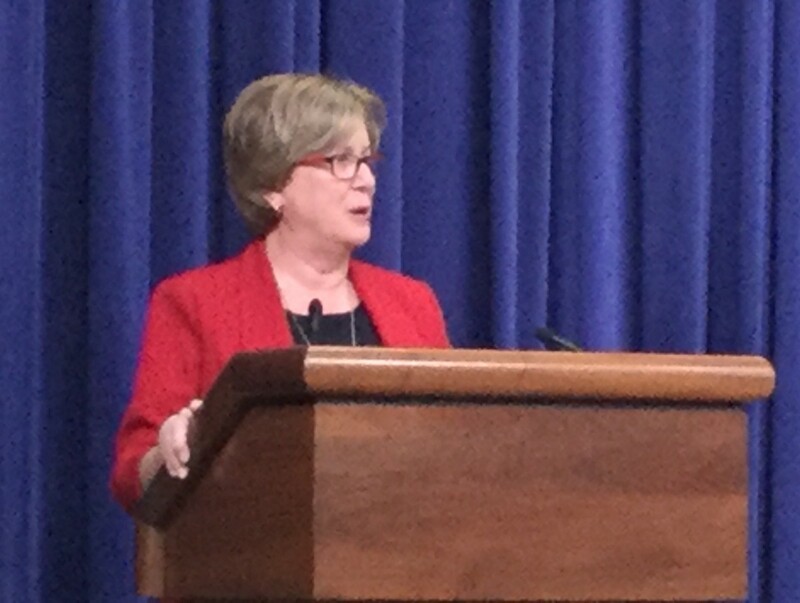 Joan (pictured here) is the Assistant Director at NSF for the Education and Human Resources Directorate. She speaks for Education Research. She phrased her remarks as three research areas for the CS for All initiative, but I think that they could be reasonably interpreted as three sets of warnings. These are the things that could go wrong, that we ought to be paying attention to. 1. Graduation Requirements: Joan noted that many states are making CS “count” towards high school graduation requirements. She mentioned that we ought to consider the comments of organizations such as NSTA (National Science Teachers Association) and NCTM (National Council of Teachers of Mathematics). She asked us to think about how do we resolve these tensions, and to track what are the long term effects of these “counting” choices. Both the NSTA and NCTM statements are really saying that you ought to have enough science and mathematics. If you only require a couple science or math courses, then you shouldn’t swap out CS for one of those. I think it’s a reasonable position, but Joan is suggesting that we ought to be checking. How much CS, science, and mathematics are high school students getting? Is it enough to be prepared for college and career? 2. Teacher Credentialing: Teacher credentials in computer science are a mishmash. Rarely is there a specific CS credential. Most often, teachers have a credential in business or other Career and Technical Education (CTE or CATE, depending on the state), and sometimes mathematics or science. Joan asked us, “How is that working?” Does the background matter? Which work best? It’s not obvious — some CS Ed researchers have pointed out that CTE teachers are often better at teaching diverse audiences that science or mathematics teachers, so CTE teachers might be better for broadening participation in computing. We ought to be checking. In Computer Science, everything is new and just developing. We just had the K-12 CS Framework released. There are ISTE Standards, and CSTA Standards, and individual state standards like Massachusetts’. 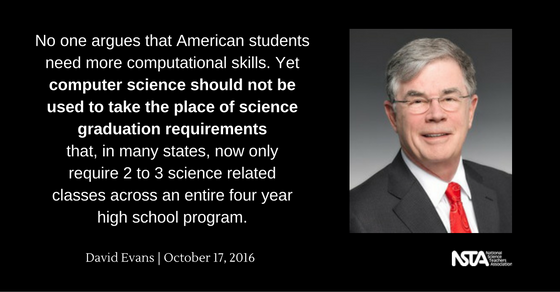 Unlike, science and mathematics, CS has almost no assessments for these standards. Joan explicitly asked, “What works where?” Are our frameworks and standards good? Who’s going to develop the assessments? What’s working, and under what conditions? I’d say Joan is being a critical friend. She wants to see CS for All succeed, but she doesn’t want that to cost achievement in other areas of STEM. And she wants us to think about the quality of CS education with the same critical eye that we apply to mathematics and science education. The second day was just us, just the ECEP state teams talking with one another about the things that we care about and what we need to succeed. Thanks to our colleague Shelly Heller, we held the event at the beautiful Mt. Vernon campus of George-Washington University. CSNYC, charged with implementing Mayor DeBlasio’s mandate for CS for all students in all grades in all schools, has decided to define that as a school-based mandate. Each school is charged with providing a high-quality CS education opportunity for every student in every grade every year, but that might not be a full class. New Hampshire is exploring the possibility of micro-certifications. Rather than getting a certification as a CS teacher, a mathematics or science teacher might get a micro-certification to demonstrate proficiency in using a computer science approach to their teaching. There might be micro-certificates in Bootstrap, CT STEM, or Project GUTS for middle school science. I sat with the team from North Carolina as they were reviewing data that our evaluation team from Sagefox had assembled. It was fascinating to work with them as they reviewed their state data. I realized in a new way the difficult choices that a state has to make when making progress towards the CS for All goal. In the discussion that follows, I don’t mean to critique North Carolina in any way — every state has similar strengths and weaknesses, and has to make similarly difficult choices. I just spent time working with the North Carolina team, so I have their numbers at-hand. North Carolina has 5,000 students taking CS in the state right now. That was higher than some of the other states in the room. I had been sitting with the Georgia state team, and knew that Georgia was unsure if we have even one full-time CS teacher in a public high school in the whole state. The North Carolina team knew for a fact that they had at least 10 full-time high school CS teachers. In 2015, the only 18% of Blacks in North Carolina who took the AP CS exam passed it. (It rose to 28% in 2016, but we didn’t have those results at the summit.) The overall pass rate for AP CS in North Carolina is over 40%. Only 68 teachers in the state took any kind of CS Professional Development (that Sagefox could track). There are 727 high schools in the state. Knowing that there are 727 high schools in the state, we can put the 5,000 high school students in CS in perspective. We know that there at 10 full-time CS teachers in North Carolina, each teaching six classes of 20 students each. That accounts for 1,200 of those 5,000. 3,800 students divided by 717 high schools, with class sizes typically at 20 students, suggests that not all high schools in North Carolina have any CS at all. Given all of this, if you wanted to achieve CS for All, where would you make a strategic investment? Maybe you’d want to raise that Black student pass rate. North Carolina is 22% African-American. If you can improve quality for those students, you can make a huge impact on the state and make big steps towards broadening participation in computing. Maybe you’d want to work towards all high schools having a CS teacher. Each teacher is only going to reach at most 120 students (that’s full-time), but that would go a long way towards more equitable access to CS education in the state. Maybe you’d want to have more full-time CS teachers — not just one class, but more teachers who just teach CS for the maximum six courses a year. Then, you create an incentive for more pre-service education and a pipeline for CS teachers, since then you’d have jobs for them. The problem is that you can’t do all of these things. Impacting any one of these goals is expensive. You can really only go after one goal at a time. Which one first? It’s a hard choice, and we don’t have enough evidence to advise which is likely to pay off the most in the long run. You can see similar tradeoffs arising in other places. Brooklyn just released a report about their progress in achieving CS for All (see post here with linked report). They are way ahead of the rest of the country in getting CS teachers, but they are facing challenges in having enough laptops and network connectivity. So, do you spend resources on more teachers or more equipment? We are just at the beginning of getting computing education to every student in the United States. We may be talking about decades of work yet. Our state teams in ECEP are doing the hard work of starting. It was really terrific to get researchers, policy-makers, and leaders from states together to talk about what’s working and how to make progress.